One of the most beautiful scenery for your Silk Road tour is Luntai Huyang Poplar Forest Park. At the southern foot of the Tianshan Mountains, edged on the other side by the forbidding Tarim Basin, lies Xinjiang's desert forest, Luntai Huyang Poplar Forest Park, as oxymoronic as that may seem. The reason life flourishes in such an arid zone is due to the Huyang poplar trees. Luntai is the world's largest preserve of Huyang poplars, 27, 000 hectares' worth. Luntai Huyang Poplar Forest ParkLuntai County, lying at the southern foot of the Tianshan Mountains and the northern edge of the Tarim Basin, possesses the world’s largest, densest and best-surviving “living fossil of the Tertiary Age”----a natural Huyang (diversiform-leaved) poplar forest of more than 27,000 hectares. 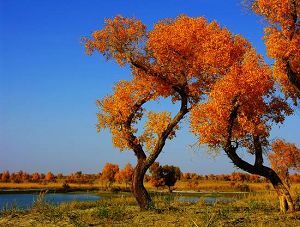 The Huyang poplar forest is common desert forest meadow vegetation in the Tarim Basin, growing from upper to lower reaches of the Tarim River valley In spite of a rather simple structure, clearly the forest has ecological markings of the bio-zone in which it grows. The Tarim Basin boasts the world’s largest area of natural Huyang poplar forest and this roadside forest of over 2,700 hectares is merely a small part of the whole. The forest grows along the meandering course of the silt-laden Tarim River, and stretches to the remote horizon. There is a beautiful small lake in the forest where waterfowl including swans from the silty Tarim river find nesting grounds. Hares and corsac foxes compete with hawks for the many rabbits burrowing in the poplars' roots. It is should be contained your China vacation deals in Xinjiang. 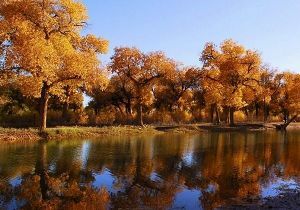 Huyang poplars are called "most beautiful" in the local Uighur dialect, but that may more accurately be termed "most hardy". 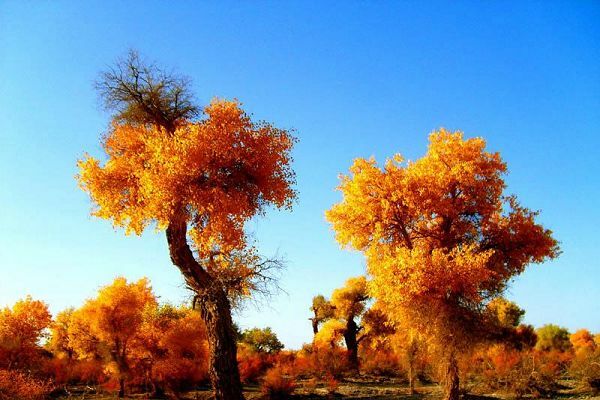 Huyang poplars grow only in the desert and have always been engaged in struggle with it. Faced with cruel broiling heat and drought, only these diversiform-leaved poplars still stand in the desert, brimming with energy and life force. It is also acclaimed as the “desert hero” because of its unyielding life force and amazing ability to endure drought, sandstorms, and saline and alkali soils. Folk have made heroes of them for their ability to grow erect for a thousand years, live for a thousand years after falling, and life and remain undying after death for another thousand years. In autumn, Huyang poplars in the wild dress in their most splendid attire of the year. Mid-October is the ideal time to visit Luntai, when the poplars put on a riotous yellow show of dying leaves. In fact, all the shades towards crimson turn up in the endless sweep of Luntai Huyang Poplar Forest Parkbranches, particularly among the red willow and oleaster, but deep yellow prevails, lending the forest an eerily beautiful glow. Those few weeks in October are one of nature's great affirmations that abundance can come from desolation. The sturdy trunks and gigantic crowns manifest that they have stored up enough energy. The poplars will withstand the harsh approaching winter with their tenacity and vigor. There are other 3 trains to run daily passing Kuerle City from Urumqi. Note: “T” means limited express train with air-conditioner, “Only figures” means general train with air-conditioner. In Urumqi taking by bus at Nanjiao Bus Station to Kuerle(Korla) City is CNY 89-137/person lasting about 6 hours. In Urumqi taking by bus at Nanjiao Bus Station to Luntai County is about CNY 53-82/person lasting about 5 hours. There are many minibus from Luntai County to Luntai Huyang Poplar Forest Park. IF you hire a private car, it is about RMB100. Luntai Huyang Poplar Forest mainly centralism distributes between Lunan and Tahe. The distance from Luntai County to Lunnan (lóu lán 楼兰) is 43km and from Lunnan to Tahe (tǎ hé 塔河) is about 20km. Be sure to take warmer clothes for the nights and always carry plenty of drinking water even in the cooler months. Be sure to respect local ethical customs and traditions. Please take enough food, water and compass. Please take sunbonnet, sunglass, canteen, respirator, muffler and suntan oil in summer. If you want to know more information about it, you can contact with China tour operator.